The magazine is product oriented by publishing information, analyzes and assessments of military technologies in different market niche - land, naval, C4ISR, air, space, cyber, soldier equipment etc. 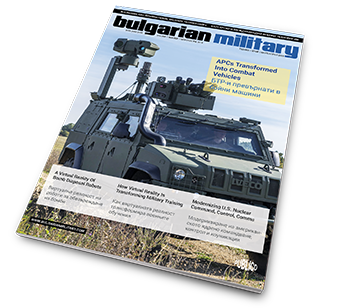 The magazine has printed circulation of 1000 copies and is distributed to the Bulgarian military industry, the Ministry of Defense, as well as to international diplomatic missions in Bulgaria and to Bulgarian diplomatic missions around the world. Bulgarian Military Magazine is a media partner of the Bulgarian defense and security exhibition "Hemus", Plovdiv.